I have been trying a lot of face washes lately and though some have disappointed me, I am glad that most have worked well for me. One such good find is SSCPL’s Acne Free Face Wash. At first, I was really disturbed by the colour of the face wash because I have never used a black colour greasy face wash before. I generally opt for gel-based cleansers that are suitable for oily skin. I opted for this face wash because it contains activated charcoal and since I am happy with SSCPL’s other charcoal based products, I was sure this product too would work for me. I used this product for a few weeks now and here is my experience with it. Activated charcoal deep cleanses the skin, minimizes pores and fights acne and pimple. Bamboo extracts prevent premature ageing, polishes the uppermost layer of the skin and combats pollutants, toxins and free radicals. Squeeze out the required amount of product onto your fingers and gently massage over damp face. Rinse with regular water. The face wash comes in a black and white tube with a green flip cap. The face wash is thick, greasy and black in colour. It smells like a perfume. It is easy to massage on the face. It does not form a lot of foam which is something I like because lack of foam indicates absence of soap and this face wash is indeed soap free. I do suffer from acne issues. My acne is hormonal so no face wash can make it completely disappear. This face wash does not claim to ‘cure’ acne but keeps the skin clean and healthy enough to fight acne inducing conditions. I have used this face wash for three weeks twice a day and I can see the difference in my skin. It makes my squeaky clean but does not dry it even slightly. My skin feels smooth and soft to touch after every wash. 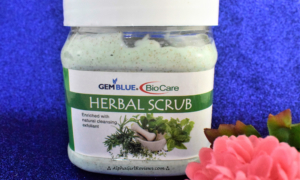 It effectively clears excess sebum and makes the skin clean and bright. However, I would like to advise that do not overuse the product especially if you have sensitive skin. I am saying this because initially I used the face wash thrice a day and my skin felt a little irritated after which I stuck to using it twice a day and it worked great for me. Nothing. It worked well for me and I am content with the result. I give SSCPL Acne Free Face Wash 4 out of 5 rating. This face wash worked well for my acne prone oily skin and I would certainly recommend it.